Apps from Cydia have always been useful to us in one way or the other, this is one such App which may not be used on a daily basis but promises to give what we need when it is required the most. 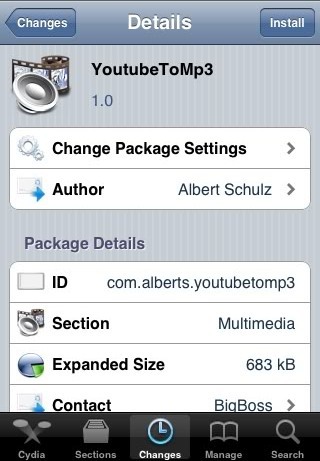 YoutubeTomp3 converter is an App which as the name aptly says converts YouTube Video into a mp3 file which you saw and need the mp3 file of the video and cannot find it on the net, this is where YouTube to mp3 comverter comes into supports Multitasking in your iPhone so that you can play music in the background and converter doing its thing. This leads to another page asking you to confirm the download which will download and install the app. Helps you convert YouTube video to mp3 files. After the Link is copied to the Download section the iPhone Youtubetomp3 converter comes into action and starts converting the YouTube Video you selected and converts it into mp3 file and saves it in your iPhone you can see the converter icon beside the Downloads icon in the lower part of the App. You can also copy the YouTube url from your browser and paste it in the Converter option where a box is given YouTube URL which leads to the Downloads section where your YouTube Video will be converted to mp3 format and saved to your Phone.